NASHVILLE, Tenn. — Americans pray for their friends, families, and sometimes their enemies. They ask for divine help in times of trouble but rarely praise God’s greatness. And they seldom add politicians, nonbelievers, or even their favorite sports team to their prayer lists, according to a new survey from Nashville-based LifeWay Research. “Most people pray when they need the red phone for help,” said Ed Stetzer, executive director of LifeWay Research. “But their prayer life isn’t a habit rooted in a relationship with God. 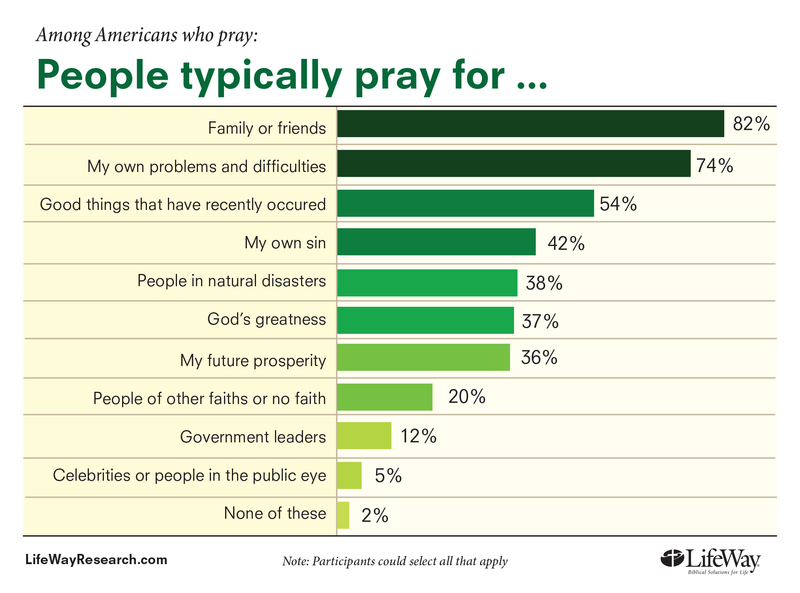 The online survey, conducted Aug. 7, 2014, asked 1,137 Americans about the frequency and content of their prayers. When they pray, most Americans (82 percent) typically focus on their friends and family or their own problems (74 percent). Just over half (54 percent) pray about good things happening in their life, while over a third pray for their future prosperity (36 percent). Prayer works for almost everybody. 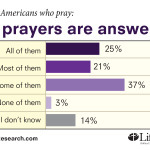 Most Americans who pray (83 percent) think at least some of their prayers are answered. That includes one in four (25 percent) who say all their prayers are answered, one in five (21 percent) who say most of their prayers are answered, and more than one in three (37 percent) who say some of their prayers are answered. 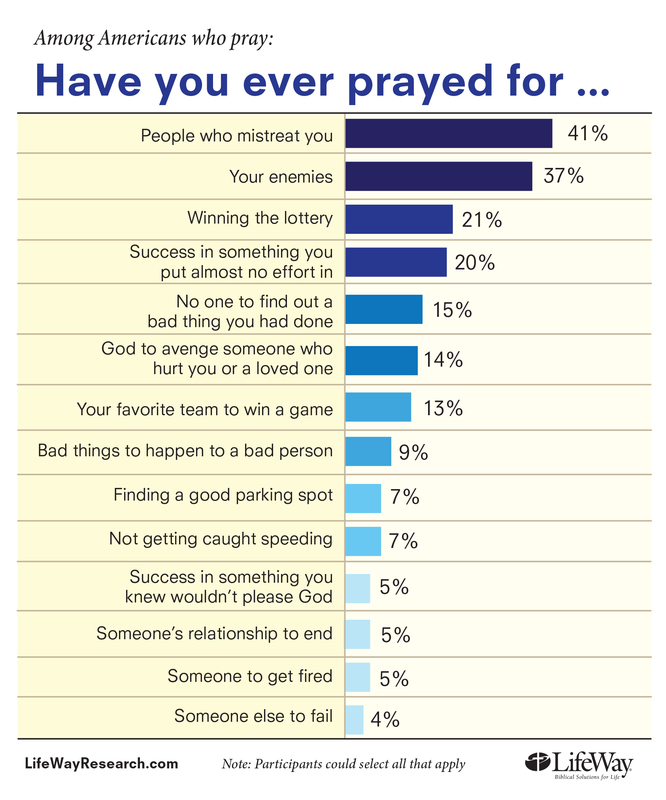 Few (3 percent) say none of their prayers are answered. 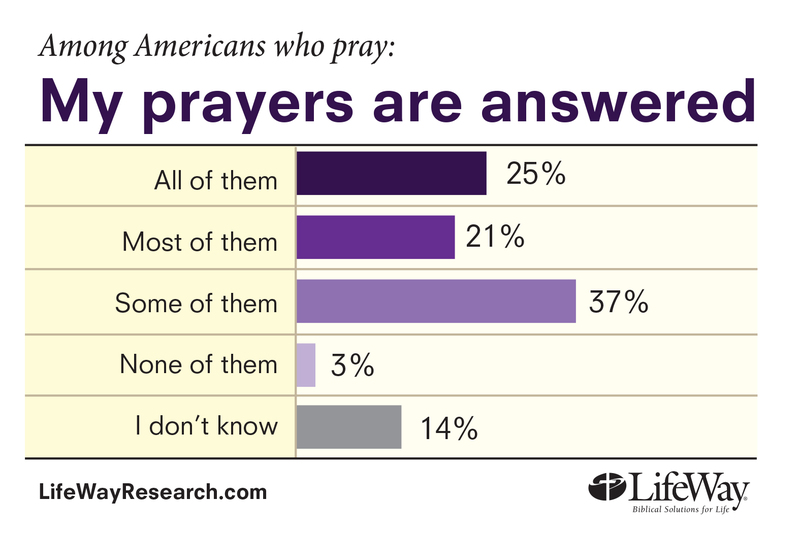 One in seven (14 percent) “don’t know” if prayers are answered. Politicians don’t have a prayer. Neither do parking spots. Only about 12 percent of Americans who pray say they pray for government officials, while few (5 percent) pray for celebrities. 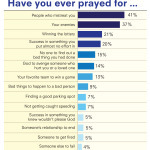 Among other things people have ever prayed for are parking spots (7 percent), other people to be fired (5 percent), or to avoid being caught speeding (7 percent). Sports teams have received a bit more prayer support (13 percent) while about one in five (21 percent) Americans who pray say they have prayed to win the lottery. Fifteen percent have prayed something bad they did will not be discovered. American’s prayers are not always biblical. More than a third of Americans (37 percent) who pray say they have prayed for their enemies, and four in 10 (41 percent) have prayed for people who have mistreated them, which the New Testament instructs people to do. More than a third (38 percent) typically pray for people affected by natural disasters. But only one in five pray for people of other faiths or people of no faith. 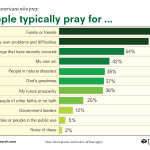 Americans are persistent in their prayers. About half of Americans (48 percent) say they pray at least every day, while a third (31 percent) say they pray several times a day. Overall, about two-thirds (65 percent) of Americans say they pray at least once a month. That’s a good start, says Max Lucado, author of Before Amen: The Power of a Simple Prayer, published last month from Thomas Nelson. Lucado, who partnered with LifeWay Research on the prayer survey, says the survey shows that prayer still has widespread appeal in American life. Methodology: The online survey of adult Americans was conducted Aug. 7, 2014. A sample of an online panel representing the adult population of the U.S., was invited to participate. Responses were weighted by region, age, ethnicity, gender, religion and income to more accurately reflect the population. The completed sample is 1,137 online surveys. The sample provides 95% confidence that the sampling error from this panel does not exceed +2.9%. Margins of error are higher in sub-groups.